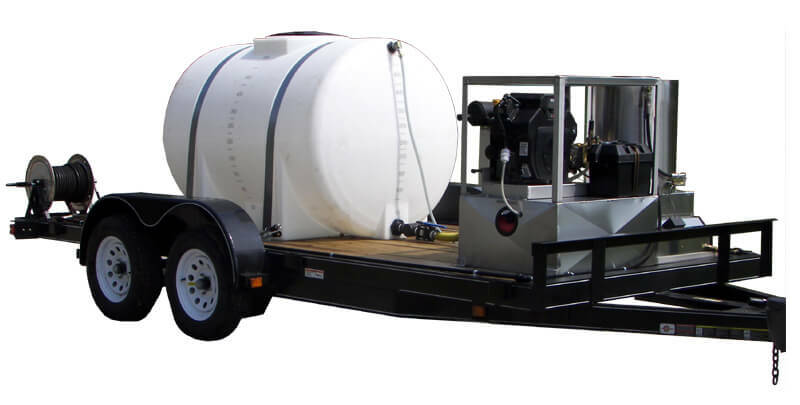 If your future pressure washer will be active for the extended number of hours, if you have to operate it outdoors, and mobility is an issue, you need to consider the heavy duty trailer mounted pressure washer. These units come with a heavy duty wand with quick change tips in 0", 15°, 25°, 40° soap tip on hot water and machines over 3.5 gpm. 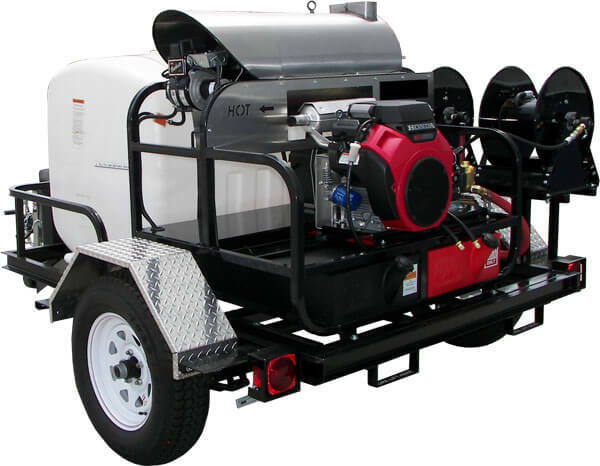 100' non-marking pressurehose on swivel reel (360 degree spin), adjustable thermostat on hot water washers, 14" wheels, and road ready lighting are only a few features, which make these pressure washers some of the best money can buy . The great advantage of these models is that they can be transported and moved by connecting them to the hook of a truck or a van. Additional advantages include adjustable pressure valve, chemical injection for easy cleaning solution application, nozzle tips for a wide range of cleaning jobs, automatic engine shut off protection if the machine runs dry, trigger gun and heavy duty wand for secure grip and smooth operation. Enjoy the freedom and convenience of easily transportable trailer models! Own It Or Lease It For As Little As $249.00 per month! Use our financing program and get the chemical package for FREE! Learn more about the Advantages of Equipment Leasing. During tough times, can you afford to clean slower than your competitors? Clean twice as fast with higher water volume output! NOTE: SK30005VH-K comes equipped with Belt Drive pump and K7 sensitive unloader. * Sorry, no free freight to Texas. Please call 866-858-4982 for rates. These items require California sales tax to be added to California deliveries. * These products requires California sales tax to be added to California deliveries. 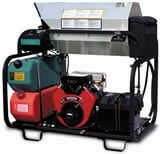 Large selection of pressure washer burners that produces hot water for your machine. Powdercoated frames, stainless steel coil wrap, adjustable thermostat, forced air burners. 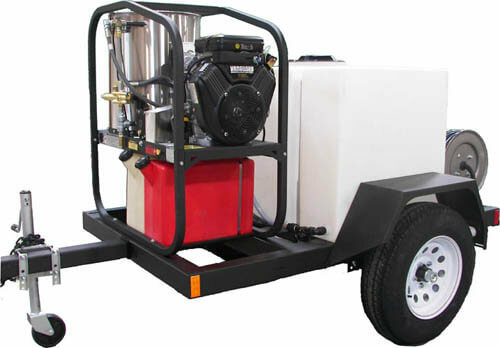 If your future pressure washer will be active for the extended number of hours, if you have to operate it outdoors, and mobility is an issue, you need to consider the heavy duty trailer mounted pressure washer. This skid mount pressure washer is designed as the model RMG-CH1300-03 shown above. 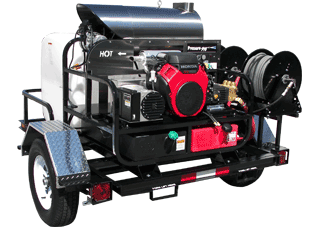 Equipped with a 24 HP Honda engine, you'll be able to mount it on a pick-up and take with you this powerful 4000 PSI hot water pressure washer that will do the any job! Our Trailer mounted pressure washers are special ordered. They are non-returnable, non-cancelable items. Briggs Intek, Honda and Vanguard are gasoline powered engines. Hatz is diesel powered engine.